You can have 1 "Grandmaster of the Six Samurai" monsters on your side of the field. While you control a face-up "Six Samurai" monster, you can Special Summon this card from your hand. When this card i.. This monster's metabolism enables it to endure long periods of cold, harnessing the power to become a creature of solid ice! Nothing else can withstand such temperatures, especially victims of its gla.. When this card attacks or is attacked, your opponent draws 1 card. 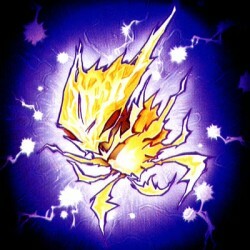 Reveal that card, and based on its type apply the proper effect: ● Monster: End the Battle Phase. ● Spell: You can change this attack..
Once per turn, while you control another "Six Samurai" monster with a different name, you can destroy 1 face-up Spell or Trap Card. This monster cannot declare an attack during the turn this effect is..